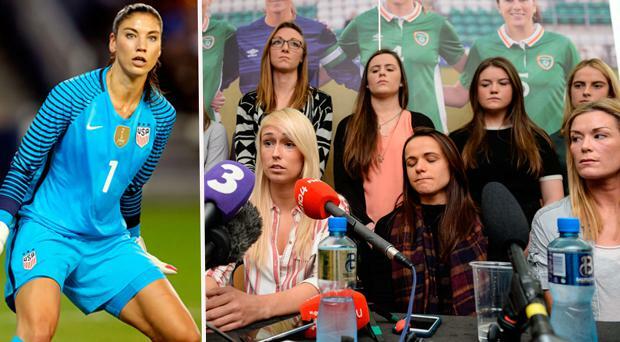 Two-time Olympic gold medalist Hope Solo said that the Irish women's team protest against the FAI earlier this year was incredible. In April, 13 players of the Irish women's team. supported by the players' union, the PFAI, spoke to the media in Dublin about issues such as the lack of remuneration for players on international duty, the lack of proper kit, gym membership and other matters. Solo, who had her national team contract with US Soccer terminated last year 'for conduct that was counter to the organization's principles', claims that women’s teams must put their foot down in negotiations for equal rights after she played a prominent role in the US women’s team’s battle against the United States Soccer Federation for equal pay. "I'm not saying we're as good as the men, I'm not saying we're as fast as the men, I'm not saying we're as strong as the men, but there is value in women's sport," Solo told Joanne Cantwell at the One Zero conference in Croke Park on Tuesday. "[US women's team] You've brought in $20 million for the federation, the men lost $2 million for the federation. "You look at what the Republic of Ireland did, it's incredible. I think everyone needs to give them a round of applause and they had the support of the public and a huge fan base here. "They had to put their foot down against the federations to get only what is considered basic rights; hotel wi-fi, attire, bonuses; but it never would have happened if they didn't put their foot down. "That's why I really look up to the women of Ireland who realised that in order to get power you have to take it. "These women were losing money because they had to take time off their work, their day-to-day jobs to go into a camp to get right for the World Cup, or get right for the Olympics, and they're losing money to do that and what do the federations say? "They say 'you should be grateful, it's an honour to play for your country'. Of course it's an honour to play for our country but we can't lose money to do that." Cantwell raised the point that the women's team had the support of the public when it came to rights and issues of decency, but that often the women's team failed to see literal support in terms of attendances at their matches. Solo said that brands and corporations need to take a greater stand in promoting women's sport to help narrow the divide between men's and women's sport. "We love popularity," added Solo. "We see men's NFL on TV and we all gravitate towards that so I'm not going to say that it's the women's fault for going to qualification games in front of 200 fans. "Are you teaching the value of men versus women in our society and across our globe? It's a responsibility of the federations, it's a responsibility of the individual fan base I guess, but we have to get them to come to the games and see the value. "Once they see the value I have confidence they'll appreciate the game. But CEOs of corporations? The marketing dollars that go into marketing the women's team? "If you don't see them on TV why are people going to gravitate towards the games? We have a responsibility to teach our young girls and our young boys what's more important in society? "Is it men or is it women when it comes to football."